25 pages of instructions and tips on teardown and rebuild. Produced around 1970, likely by one of the two USA distributors. As Triumph was, for many years, a BSA-owned company, BSAs and Triumphs shared many common parts. Sometime in the late 1960s, BSA produced two intechange lists: each showing the equivalent part numbers and names of the other. Each list is about 40 pages long and may be downloaded as a .pdf document. THE A70 Lightning was the last of BSA A7/10/50/65 line. Created in 1971 at the request of the BSA's American distribution division, only 200 were made (the minimal number to qualify as "production machines" for dirt track racing) and all were sent to the US. The increased capacity was gained by lengthing the bore of the A65L to 85mm. Fewer than 20 parts differ between the A65L and the A70L (not including the rear sprocket which has an additional tooth on the A70L). View A70L spares list. 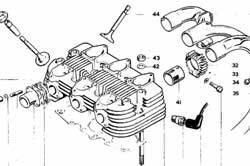 In mid-1969, modifications were made to the needle, needle jet, and jet holders on concentric carburettors fitted to BSA A50/65s. These must always be fitted in matched sets - yet even the factory shipped them mismatched, resulting in erratic operation. This factory service sheet (Sheet 5-70) explains how to identify component matches. View service sheet.